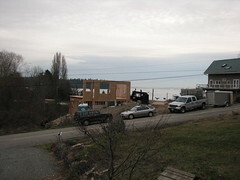 Twenty years ago when we built our first home on the grassy hillside of Southworth Estates we knew that someday the beautiful view would be obstructed by a house across the street. After years of enjoying the view and keeping the trees trimmed, the fateful day has arrived. The views of the sound and ferry will only be slivers, though the territorial view and neighborhood remain. Our consolation. of course, is that we no longer live in the house, and the one we now enjoy will probably never lose its view. However, being the owners of the other house, we will bear the financial consequences of this 'view veiling' Speaking of 'view veiling', I better get busy on some 'tree trimming' before the spring budding starts!